Tater and Tot. Biscuit and Gravy. Drumstick and Wishbone. Pumpkin and Pecan. This is not a laundry list of the foods you’ll find this year on your Thanksgiving table, but rather the names of turkeys whose lives have been spared over the years after being presented to our country’s presidents. 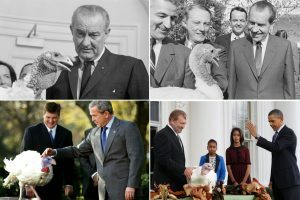 Though Americans will eat 46 million turkeys this Thanksgiving, the turkeys given to the White House, at an annual ceremony held in the Rose Garden, will not be eaten. Each president since Ronald Reagan (and a few previous ones) has paused from regular business for this annual presentation (learn a bit about the history of turkey pardons here.) The event now ends with the giant (30+ lb.) turkeys—typically donated by the National Turkey Federation—receiving an official presidential pardon and getting donated to a petting zoo, children’s farm, or similar destination that does not include anyone’s dinner table. While the Reagan years were marked by very informal ceremonies with a microphone and no prepared remarks, the Thanksgiving event has evolved into more pageantry—a larger audience that often includes schoolchildren, contests to name the turkeys, and a short speech from the president that typically outlines the spirit of Thanksgiving and, in more recent years, gives thanks to American troops. There is usually quite a bit of levity at these events, which are often accompanied by a few gobbles on cue from the guest of honor. President Reagan told of a time when, while carving a turkey during his tenure as governor of California, he noticed blood on the turkey and realized he had sliced his thumb open. President George H.W. Bush talked about how they let the turkey roam the White House grounds but had to keep it separate from their dog, Ranger, to avoid a confrontation. While all presidents took a moment to share things that made them grateful, President George W. Bush’s speeches were the shortest (less than three minutes) and tended to be mostly serious in tone. Regardless of whether you name your turkey, eat it, or pardon it, we wish you a very happy Thanksgiving holiday! If you need help cooking your turkey this holiday, here’s a quick reminder that the Butterball Turkey hotline (based here in Naperville, Illinois) will field 100,000 calls this year. For some extra fun, check out Stephen Colbert’s 2016 attempt to pose as a turkey expert.